Note Added Feb. 15, 2010: You can download a schematic diagram of my modified 516F-2 by clicking HEREAlso, I have just learned that the custom power transformers and chokes specified on this website are currently available from the Heyboer Transformer Company. Email Alden at alden@charterinternet.com for prices and delivery information. The Collins 516F-2 is a heavy-duty power supply for the KWM-2/2A transceivers and the 32S-1,2,3 series of Collins transmitters. Over the years, power cords become frayed, the electrolytic capacitors dry out, and the potted bias rectifier modules give up the ghost. These problems can be easily solved by replacing the bad components with modern equivalents. More serious problems are inherent in the power supply's design itself.The heavy startup surge current can damage the on/off switch in the controlling rig, and the output voltages are too high for today's higher line voltages, causing radios to run hot. Furthermore, one cannot simply substitute solid state rectifiers for the 5U4 and 5R4 rectifier tubes, because the resulting voltages will be higher still, typically in excess of 1000V for the HV, and well over 350V for the LV. The nominal B+ voltage requirements of the Collins radios are 800V and 275V. Here is the original "junker" 516F-2 that was the starting point for this project. It had a bad power cord and interconnecting cable, a poorly installed replacement tube socket, chipped connectors and innards that were, well, best not talked about. I decided there wasn't much point in trying to turn this ugly duckling back into the Cedar Rapids swan it once had been. The new replacement transformer and filter chokes were designed and sold by Bill Abate K3PGB and manufactured by Heyboer Transformer Co of Grand Haven, MI. A couple of years ago I acquired an excellent, newly designed replacement power transformer and pair of filter chokes for the 516F-2. These beauties were sold by Bill Abate K3PGB, as a service to the Collins collectors' community. This new iron has significantly improved specifications: the transformer is designed to produce the proper voltages with solid-state rectifiers and has a tapped primary to accomodate line voltage variations. The new transformer runs cooler and the chokes have higher current ratings than the failure-prone originals. At last, the project worked its way to the top of my "to-do" list and I took the new parts off the shelf. I have several 516F-2 power supplies and considered simply swapping the new iron for the old in one of them as part of a restoration. Eventually, however, I decided to "rebuild" rather than "restore." I needed a supply that I would use, that had all the features I wanted, but that would be hidden out of sight behind the desk or in its cabinet. I didn't care if it resembled the original. As it turns out, one of my 516F-2s was a near-junker. 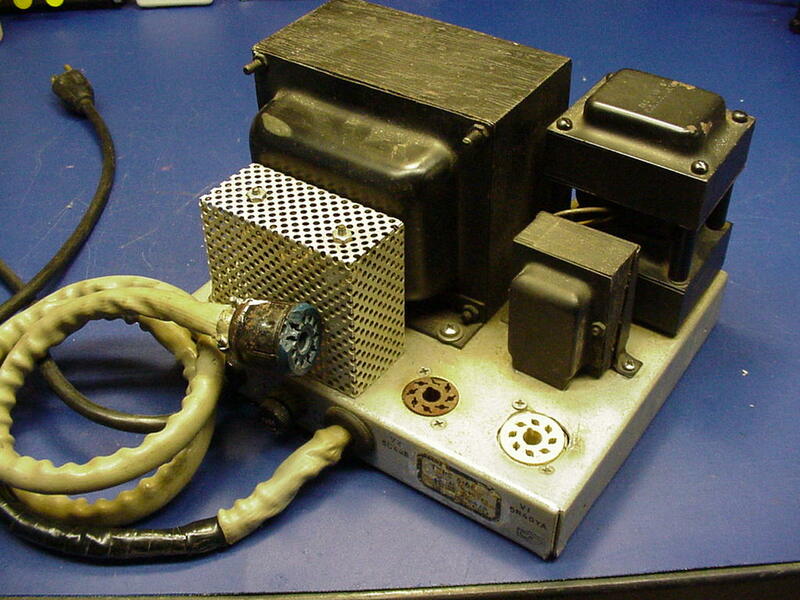 It had a sloppily enlarged tube socket hole, broken connectors, worn-out power cord and connecting cable, and a mish-mash of capacitors and resistors hanging from the bottom. There was no way this baby could be made presentable. It was the perfect candidate for a rebuild. I started by stripping it down to the bare chassis. A trip to the kitchen and two dishwasher cycles later, the grunge on the chassis came off nicely. (Funny how the meat loaf the next day tasted like burned resistor.) Shorn of all its components, however, the chassis' gouged tube socket cutout really looked awful. After two cycles in the XYL's dishwasher (using the pot-scrubber cycle), the chassis is beginning to look presentable. A new rectangular opening with a cover plate replaces the original gouged tube socket cutout. There's nothing quite as classy as the silver-ceramic terminal strips from old Tektronix oscilloscopes, and I used several of them to mount the two diode rectifier banks. Twelve 1N4007 diodes (in four strings of three) replace the 5U4 and 5R4 rectifier tubes. The diodes lay between the Tektronix strips, and the whole assembly sits on a small piece of glass-epoxy circuit board. The diode strings replace both of the original 5U4 and 5R4 rectifier tubes. There are two grommets in the 516F-2 that ferry wires through the chassis. A dab of Armour-All restored them to like-new condition. Next I mounted the transformer, chokes and other components on the chassis. The new filter capacitors didn't fit in the existing clamps, so I drilled out the clamps and replaced them with another glass-epoxy board. More Tek terminal strips hold the new capacitors and voltage equalizing resistors, and 8-conductor rotor cable replaces the original interconnecting cable. Now the fun part begins -- wiring up the supply! Two evenings later, and the job is done. The diode bank is in the lower left of the photo, and above it is the metal .05 uF resonating capacitor for the HV filter choke. The new circuit board with the filter capacitors and equalizing resistors is mounted on 1/4" metal standoffs in the middle-right of the supply. (Modern metal-film resistors replace the old 270K composition resistors.) The remaining octal tube socket along the bottom now is wired to accept a plug-in relay. The bias circuitry with its original adjustment pot is in the lower right. Finally it comes time for the smoke test. Fortunately, everything seems to work fine and, best of all, the voltages are comfortably with in a few percent of Collins' specified values. The plug-in relay is a DPDT Magnecraft model 750XBXM4L-120A (Mouser p/n 528-750X4-120A, $11.50), with a 120VAC coil and dual 16 Amp contacts. It is activated by the transceiver power switch, and takes the burden off the switch contacts. The relay features an LED that lights when the DPDT contacts close and a push bar to activate them manually. I soldered 150V Varactor surge protectors across the relay contacts (at the tube socket pins) to limit arcing caused by the inductive kick of the transformer at turn-off. Here is the completed supply, with its shiny new iron, control relay and mostly new parts. About the only components remaining from the original supply are the small 1H filter choke, the bleeder resistors and cage, and the bias adjustment pot. After the photo was taken, I added a bottom plate to keep fingers out of the innards. And lastly, before buttoning up the supply in its cabinet, is an on-the-air test. After adjusting the KWM-2A bias for 40 mA resting current, and zeroing the S-meter and ALC to allow for the lower voltages, my trusty KWM-2A seems very happy. I'm very happy too, knowing that this classic vintage rig will run cooler and that the rehabbed supply will almost certainly outlast its owner. I'm really grateful to Bill K3PGB for taking the initiative to remanufacture the 516F-2 transformers, and to the Heyboer Transformer Company for their excellent product. Visitors since Jan. 10, 2004 Andale.